Jane and her friend took a stall to the dog show at Hatch Beauchamp on May Day and, in spite of the windy weather, made a very respectable three figure amount. Thanks to both of them for giving up their time on a bank holiday weekend. We would like to thank Jan Lazenby who very bravely attended the May Day Fayre last weekend in the rain. Even though the weather was terrible she still managed to raise an amazing £40. Thank you Jan you are very kind. Think all the trustees were feeling a little down in the dumps over the last couple of weeks - not everything always goes to plan!! We had a couple of dogs returned, e-mails chasing rescue space (when we don't have any!!) and I think sometimes we all wonder why we put ourselves through the heartache. However, we then get some good news, which really couldn't be better. Connie arrived with us little more than a puppy at just eleven months. She was just a bundle of fun, who I personally could have watched for hours, as she was such a happy girl without a care in the world. Connie has now found her forever home. Both Tom and his girlfriend are totally smitten with Connie, and she is quickly learning about the big wide world. Thank you both for giving this very sweet girl her forever home, and obviously a big 'thank you' to Eila for saving her. 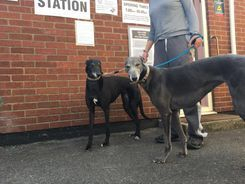 Treacle and Siouxsie at the polling station casting their votes! In the early hours of this morning, we were joined by three beauties from Ireland: Blue, Ebony and Millie. They are every bit as nice as they look and we must thank Kristie for getting up at silly o'clock to welcome them to their new quarters. Nobby/Travis (now called Trev and this will be the last time he will have his name changed) has been officially adopted by Gerry and Colin. Trev was fostered by Debbie, one of our trustees, for just over eight months and she and her husband Lee have done a fabulous job. Trev came to stay with Gerry and Colin, plus Amber and Duffy (both Bristol DAWG dogs), just over four weeks ago whilst Debbie was on holiday, however, he is still with them!! Think you will all agree from the picture he has settled well!! Duffy has not been the same since Gerry and Colin lost Ricky a few months ago but Trev has arrived and not put a paw wrong and they are all now great friends - well Duffy and Trev are and Amber is when she feels like it!!! As people know black dogs are not as popular, but this boy is absolutely adorable. PS Debbie Martin - no more holidays please as there is no more room!! Thank you to Ciaran and Rachel for undertaking a car boot sale and then for taking part in the Trowbridge May Fayre yesterday, along with Tilly, Immy, Dave, Barbara and Lynne, not forgetting Karma and Spirit (typical greyhounds who spent their time snuggled up in the corner of the gazebo!!) An amazing £178.33 was raised - thank you to everyone involved we so appreciate your support. 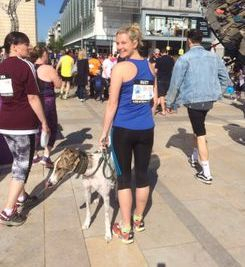 On behalf of Bristol DAWG, I would like to say a huge thank you to Suzy Pawsey, who ran in the Bristol 10K today. 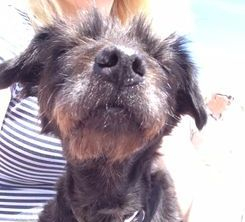 Suzy raised an amazing £780 (including Gift Aid) to help the dogs in our care. We are so grateful for her support. Suzy adopted the very handsome Teddy from us at the beginning of March and wanted to help raise money to enable us to help more dogs like him - have to say he looks very relaxed with everything that is going on around him in the picture above!!! Once again massive thanks and well done. More good news, another adoption of a black boy!!! Sue and Craig adopted Leyla from Bristol DAWG just over two years ago and decided it was time to find her a friend. Nitro (known as Nige) has been with us since September 2015, but was fortunate to have been in a foster home. Nige has been on a two week home trial just to make sure the dogs got along and I think it is fair to say from the picture below he has settled!!! Nige and Leyla are getting on really well, with Leyla even letting him share the sofa. Thank you to Sue and Craig for giving this lovely boy a second chance in life, but we must say a massive 'thank you' to Denise Smart and her lovely family for fostering Nige whilst he was waiting for his forever home. Denise, has over the last fifteen months, fostered five of our dogs and she has done a wonderful job teaching them all about home life - we are so grateful for the help you have given our dogs. Gerry spent a lovely hour today with Emily, Josh, Jess and the very handsome Pablo who has been on a two week home trial with them. Jess is also a Bristol DAWG dog. Think it safe to say that Pablo is happy in his new home and as you can see from the picture above, Pablo and Jess are getting on really well. Thank you Emily and Josh for giving Pablo a wonderful home and thanks to Karen and Dave for very kindly fostering Pablo - you did a brilliant job and Pablo hasn't put a paw wrong in his new home. 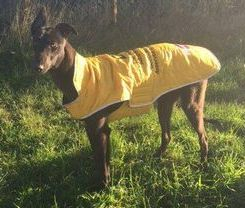 We are absolutely delighted that May has found her forever home in Longlevens, Gloucestershire with Tricia and Peter and their very handsome greyhound boy. May has been waiting a while for her own home, but we know it has been worth the wait. Thank you Tricia and Peter for giving May the home she deserves. Huge thanks also to Ann and Barry for very kindly fostering May whilst she was waiting for her new home. Thank you to Kim and Megan Simpkins-Jenkins of Platinum Pet Care for organising a wonderful online dog show for us. The Best in Show and Reserve are pictured above and all entries will be considered for inclusion in 2017's calendar, also organised by Kim and Megan. A little fundraiser for DAWG! 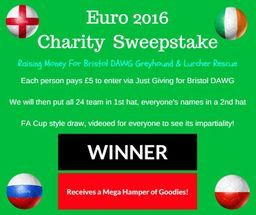 If 24 people each donate £5 we can make a nice £120 and have a bit of fun! You don't need to know anything about football, in fact its probably a bit more fun if you don't! We will film the draw and post it on Facebook so everyone can see it is completely pot luck! Please let Megan know if you donate, and state your name. Limited to 24 people. Stoke Gifford Fun Dog Show - What a Greyt day!! We were amazed at how many former Bristol DAWG dogs brought their owners along to see us!! – it’s so rewarding to see so many of our dogs, which are now in loving, forever homes, as many have not had the best start in life. So to all Bristol DAWG dogs, it was wonderful to see you and it makes all our hard work so worthwhile. We would like to say a big “thank you” to Jan Lasenby who did a brilliant job judging the dog show, with so many dogs to choose from it must have been very difficult. Well done Jan! Thanks to Colin who helped Jan by stewarding the dog show, with so many dogs in the ring he had his work cut out. Best In Show was awarded to a very handsome Doberman and Reserve Best in Show was a very sweet little Dachshund. Thank you to Robin Horsfall who very kindly invited us to the show and sponsored the rosettes. Jane’s DAWG Stall (helped by Norman) - this stall did really well selling lovely collars, coats, snoods, toys, leads, knitted greyhounds – lots of items were handmade by Jane, well done Jane brilliant job. Well done Hilary and Carol who stood on the entrance and took the entries for the dog show. In The Dog House Grooming (Avalon) – Thank you, you did a wonderful job with the nail clipping, again with donations taken coming to Bristol DAWG, you are very kind. Hoop-a-Hound/Teddy Tombola – Geraldine and Shirley very kindly ran this throughout the day and it was lovely to see so many winners. Geraldine is amazing, as for a long time she has supported us by knitting these beautiful little greyhounds. This year we had a photographer, Peter, who was here there and everywhere during the day – and there will shortly be pictures available from www.peteography.co.uk/dogshow - thank you Peter. Thank you to Susan Beese who came along with her craft stall and sold items and donated the proceeds to Bristol DAWG. Platinum Pet Care – Kim and Megan again ran their wonderful stall. Thank you for your greyt support, not only at this show but also throughout the year. Plus they brought their foster dog, Luna, along which has generated interest, paws crossed!! Also nice to meet Michelle of Cleary Canines www.ClearyCanines.co.uk who was on hand for any doggie behaviourist advice. Thank you for coming along Michelle. Thank you to everyone who supported our event and helped us to raise an amazing £945 and, most of all, thank you to Geraldine for working so hard to pull it all together! Really hope I haven't missed anyone, but a huge thank you to every single volunteer who helped during the day.